Kick off your April Artwalk with: D E I T Y - Artwork by Paloma Nava that explores latino and pop culture themes. Music by DJ Alxxs Garza will flow the cumbia/latin grooves. 5-8 PM with Happy hour prices, great food options, and lots of fun! Comedy Cafe - 2nd Fridays! Join us for an evening of laughs, hosted by Kaatje Gotcha, starting at 6 pm. Comedian lineup: Marty Adamsmith, Kendra Jean Brand, Greg Ziomek, William Spottedbear. Happy Hour drink prices, lots of great food options, and some of the best ambiance in Albuquerque's Downtown! Enchanted popup presents Strange Alterations! Featuring the work of Zak Rutledge. Ruthledge is a 505 digital artist, illustrator and design maestro! 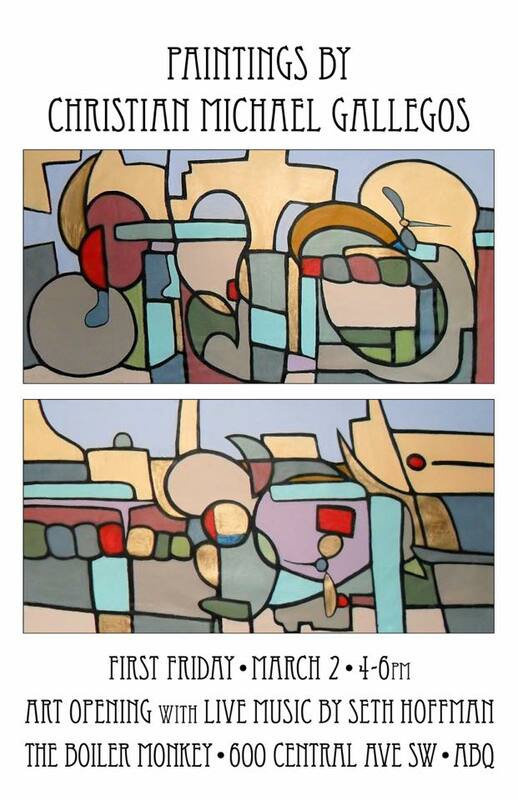 Check out his newest art series this First Friday for ABQ Artwalk at Boiler Monkey. Music from local synth-wave hero- Kevin Sting! Happy hour beer & wine and great food options. Join us for a night of laughs and fun! Comedians Rusty Rutherford, Kaatje Gotcha, Melissa Eslinger, and Ann will bless the stage with their humor. Musical performance by Da Terra Meiga. Happy hour specials, dinner available, and so much more. Come support the local comedy scene in downtown ABQ! Join us in celebrating the talents of our S T A F F ! February’s 1st Friday will showcase a collection of artwork (photography, illustrations and more) by our front of house, as well as a live performance by our own downtown Monkey / singer & electronic music composer: Zachery! 5-8 pm February 1st! Join us for a night of laughs and good entertainment, featuring comics: Kaatje Gotcha, Curt Fletcher, and Kris Shaw. Music by Adam James. $6 dollars cover at the door for wheelchair fundraiser! Enchanted PopUp presents-Ritmo! A photography exhibit featuring the work of Bobby Gutierrez. Gutierrez is known for his work with Humans of New Mexico and the Santa Fe Opera, but catch his most recent photo series titled-Ritmo! An art opening/celebration with live music from talented vocalist & composer Isaac Aragon! https://www.isaacaragon.com/ ! First Friday Jan 4th at Boiler Monkey Bistro for ABQ Artwalk! 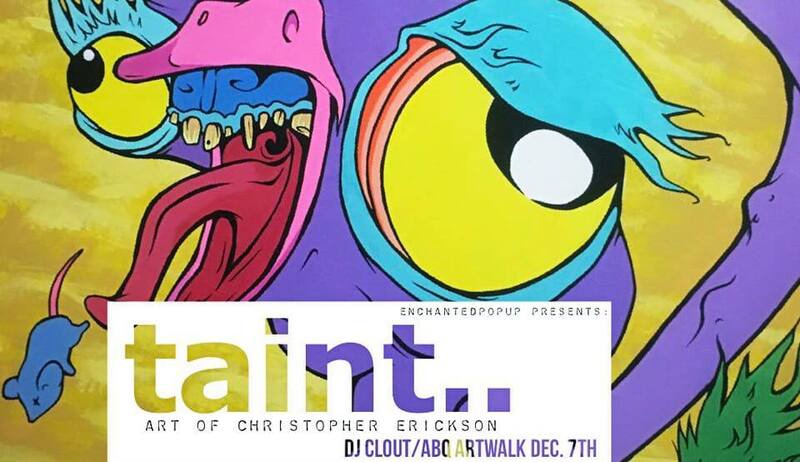 Enchanted Popup presents-TAINT! An art exhibit featuring the newest series of work form artist Christopher Erickson. Known for his vibrant street art and signature creatures, Erickson will be featuring his newest series of work at Boiler Monkey Dec 7th for ABQ Artwalk! Plus curbside live painting and music from DJ CLOUT! 5-8pm! Enchanted Popup presents-TASKV HVLWE for the next ABQ Artwalk Nov 2nd! Featuring the new series of artwork from artist Hotvlkuce Harjo! Harjo’s work explores themes of contemporary representations of Indigeneity and alternative forms of womanhood and femininity. More recently, investigating a resurgence in Mvskoke traditional tattooing through Southeastern imagery. Mellow / Ambient Digital Music performance from SAZORAM! First Friday Nov. 2nd at Boiler Monkey 5-8pm! Stop in for happy hour and support local artists! 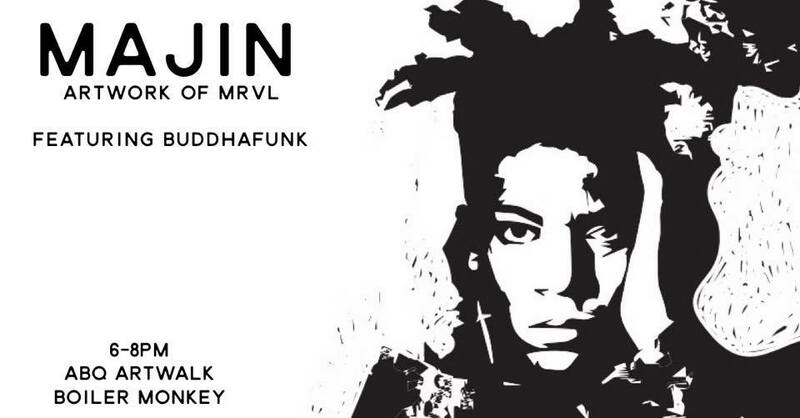 MAJIN if Mr. MRVL and Buddhafunk got together to do a First Friday artshow for ABQ Artwalk. Enchanted PopUp presents: MAJIN! Featuring the new visual artwork of Mr. MRVL with music by the one and only DJ BUDDHAFUNK (funk, soul, hiphop, top 40, disco etc)! First Friday Oct 5th at Boiler Monkey for ABQ ARTWALK! 6-8pm! JOIN US FOR HAPPY HOUR & SUPPORT LOCAL ARTISTS! Join us for a fun pop-up event with local vendors @primary_jewelry @lightshadeplants @cactus_eddie @pizzapetsandnonsense @meltdownstudio and more selling their wonderful goods for a cause! We will donate some of the proceeds to Washington Middle School for school supplies. Enjoy our wonderful Build your Own Mimosa & Bloody Mary bar, try our weekend brunch specials (Monte Cristo Sandwich & Biscuits and Gravy), and support local artists all at the same time! Boese Brother Brewery will also have live artists on display! And the wonderful Downtown Farmers Market will just be wrapping up before hand at noon! Make a day of it, exploring and celebrating ABQ Downtown. Can't wait to see you. Join us for September's First Friday Art Walk and check out awesome art by Cody Saint Arnold- featuring contemporary Native American themes and southwest pride. Meet the Jicarilla Apache artist in person! Musician Oscar Butler is a fingerpicking songwriter with smooth vocals and a great vibe! He'll perform from 6-8pm! We're kicking off August's First Friday with the Downtown ABQ Artwalk featuring nature photography by Navi Madrugada and live music with talented singer songwriter Sadé Munirah! Make us your first stop on your jaunt around downtown for all the fun festivities! Happy hour prices on beer & wine with summer drink specials too! Kick off your downtown ABQ artwalk at The Boiler Monkey. DJ Wae Funky will get you in the groove, and Artist Skelz will intrigue you with his unique creativity! Happy hour drink prices and food specials too! Then hit the block to see all the other art exhibits around downtown. Kick off your art walk with us as your first stop. 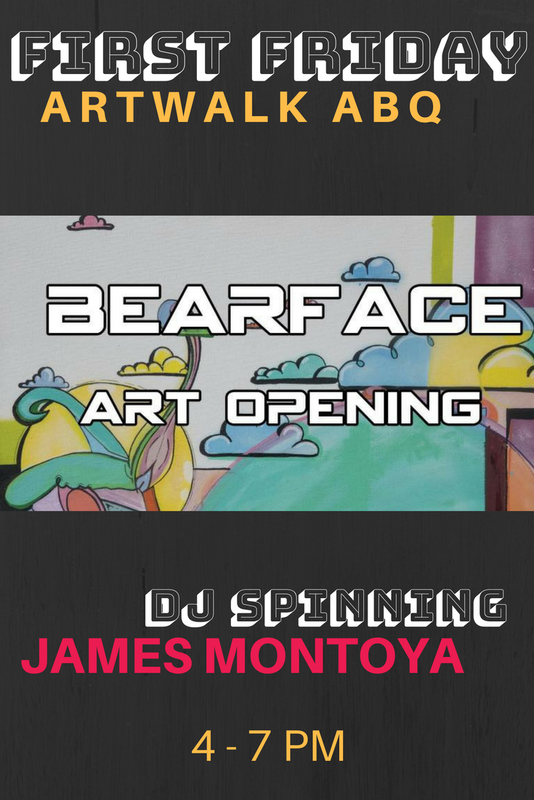 Join us for a fun evening with jams by DJ James Montoya & art by Bearface! Music from 4:30-7pm. Happy Hour prices on drinks! Event starts at 4pm. Meet the artist. 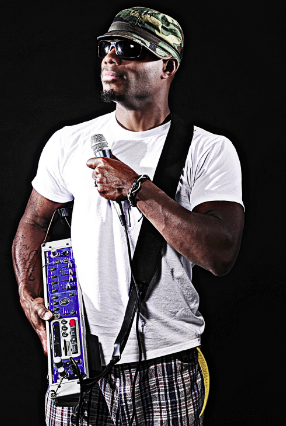 Meet the musician! Ends at 7pm! 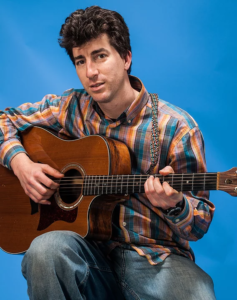 Seth Hoffman is going to lend the tunes to the afternoon and into the evening; a singer songwriter who incorporates guitar, strumstick, harmonica, voice, and loop pedal. Come for a happy hour style event and see NEW ART by Christian Michaela Gallegos http://www.christiangallegos.com/ on our walls! Celebrate live music and local art in Downtown Albuquerque and walk the block to check out the other venues after! Brought to you by Immastar Productions. Come February 2nd, we are opening the doors at The Boiler Monkey and gettin' crazy with it. Ok, we aren't doing anything too crazy - unless you mean crazy good! Come for good food, music, and art! Music by Sadé M Patterson and an art opening featuring the works of Abel Lopez brought to you by Immastar Productions. Join us every first Friday of the month between 4 pm & 6 pm for live music & great local art! First Fridays are a thing. If you've never been - change that. It's ABQ's "Arts Crawl" except in this instance The Boiler Monkey is getting involved. Come see an AMAZING art opening by Sparrow Alexis Bergen and listen to the sounds of Eli del Puerto - brought to you by Immastar Productions. LIVE MUSIC for Happy Hour with the Bathtub Alchemists- an "alternative or contemporary country band leaning hard on classic country roots." COME JOIN US FOR OUR GRAND OPENING INTO A MUCH BIGGER SPACE - WITH LOTS OF NEW FOOD ITEMS, BEER AND WINE, AND GOOD OLD FAVORITES. CHECK OUT THE INDUSTRIAL MODERN DESIGN, HAND BUILT BY THE OWNER HIMSELF. WHY: BECAUSE WE CAN'T WAIT TO SEE YOU .... AND WE NEED ALL THE LOCAL SUPPORT WE CAN GET!